Below are summaries and links to articles and features about the Banjo Babes Calendar & Album project. Have one to submit? Please let us know! Before she became a full-time musician, California banjo playing singer/songwriter Erin Inglish worked as sustainability engineer. Her work took her to the the Balkans, India, Madagascar and other countries. Today she addresses environmental concerns through music. Erin Inglish is also the organizer of the Banjo Babes calendar and album celebrating the work of her fellow female banjo players. One of the Banjo Babes is South Dakota’s Jami Lynn. She joins Inglish in a Friday performance at the Dahl Arts Center in Rapid City. Inglish travels to Sioux Falls on Saturday for a performance at Latitude 44. She joined Dakota Midday and discussed her music and the Banjo Babes. posted by Richard Hawkins @ 12:16 p.m.
Ex-Soviet Uzbekistan is not often associated with bluegrass finger pickin’ music. But that may soon change after a Russian-Korean musician from the Central Asian republic was chosen to appear in the first US “Banjo Babes” calendar, according to the project’s website. WASHINGTON, August 12 (RIA Novosti) – Ex-Soviet Uzbekistan is not often associated with bluegrass finger pickin’ music. But that may soon change after a Russian-Korean musician from the Central Asian republic was chosen to appear in the first US “Banjo Babes” calendar, according to the project’s website. “America was always my favorite country in the world. When I play banjo and when I hear its sound, I feel like I have come into the Old Wild West, where I can see cowboys, horses and saloons,” Kim told the website. posted by Richard Hawkins @ 10:18 p.m. The photo above (showing a beautiful Nechville, not to mention Janna Kim of Tashkent, Uzbekistan) comes from the Banjo Babes 2014 Calendar and CD. The calendar can be considered a bit of fun to draw attention to the CD, which showcases the talents of twenty-two young banjo-picking women. There will only be a single, limited production run of the 2014 Banjo Babes calendar and showcase CD. What isn’t pre-sold by September 8 will be distributed among the Babes for sale at their respective merch tables. If you pre-order now you can not only guarantee that you receive a calendar, but also help finance their production costs. The music of the CD can be heard both on the Bluegrass Today feature and on the Calendar website. Picture this: A bevy of banjo-playing beauties in tasteful yet tantalizing pin-up poses. The Banjo Babes 2014 Calendar and Album will feature 12 months of stunning, string-strumming women from across the world, plus a compilation CD showcasing their songs. Inglish said she and her fellow banjo players were inspired by a similar calendar featuring photos of accordion-wielding women. Renée de la Prade’s Accordion Babes Album and Pin-up Calendar has been delighting music lovers since 2009. “I thought that’d be fun to do in the banjo community,” said Inglish, whose father, Café Musique accordion player Duane Inglish, gets an Accordion Babes calendar and CD each year. 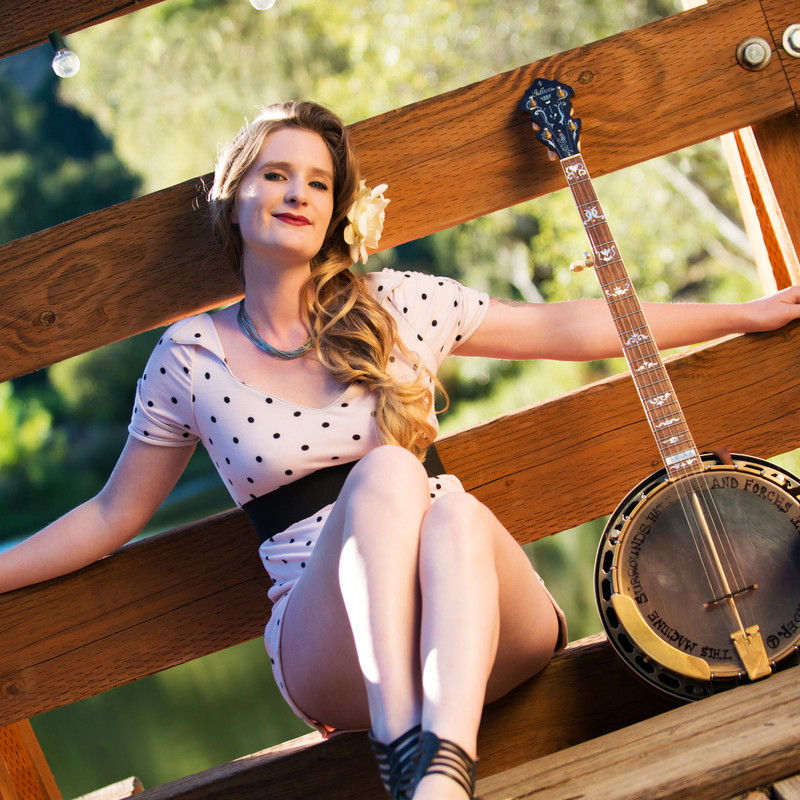 Pictured in the inaugural Banjo Babes calendar are two Central Coast residents – Inglish and San Luis Obispo musician Hayley Thomas, who sings and plays banjo in Tarweed Two & the Two Time Boys – as well as professional female banjo players from across California and the United States. There’s even a musician from Tashkent, Uzbekistan – Janna Kim. “We’re all emerging artists or independent artists. We don’t have signed contracts with labels,” Inglish explained, noting that female banjo players are an underrepresented group in the music industry. In keeping with that professional image, Inglish stressed that the pin-up-style photos are strictly PG. San Luis Obispo photographer Brittany App snapped a shot of Inglish – Miss January -- with her banjo and her bicycle, which both accompanied her on her Earth*Bike*Banjo statewide tour in April. Thomas’s playful photo, which finds her fishing with her banjo, was taken by her fiancé and bandmate Reid Cain, owner of Dr. Cain’s Comics and Games in San Luis Obispo. Each copy of the calendar comes with a CD featuring songs by the pictured artists. According to Inglish, the album offers an eclectic blend of traditional bluegrass and other old-timey tunes and more modern, innovative music. “Folks are going to get a great mix of sounds,” she said. Inglish and her fellow artists are offering Banjo Babes albums and calendars via a crowdfunding website, Indiegogo.com, now through Sept. 8. For $25, music lovers can pre-order an album and calendar; downloading just the album costs $10. Both will be shipped out in November at the latest. The musicians hope to raise at least $12,000, Inglish said, partially to cover the costs of production. In addition, they’re planning a series of Banjo Babes showcase concerts to promote the project. Go ahead… insert your favorite banjo jokes here. Those of us blessed with an affinity for the five string understand banjo envy when we see it, and that the mind of a banjo picker is one that masters detail and precision, guided by a fine appreciation for tradition, while embracing new concepts as they emerge. We can add to that a spirit of entrepreneurship, as evidenced by Erin Inglish and a bevy of banjo lovelies who are producing the 2014 Banjo Babes calendar and showcase CD. They are jointly producing, publicizing and marketing the calendar, which features each of the ladies in a retro-themed pin-up photo, along with an audio CD containing a musical contribution from each of them. But Erin says it’s not about cheesecake. It’s meant as a fun way to promote the banjo, and some of its young, less-heralded practitioners. “I know what some folks out there might be thinking, ‘Oooooh, how racy! That sounds like shameless objectification of the banjo!’ Well, I want to reassure banjo fans around the globe that while it is a pin-up themed’ calendar – it will be tasteful and fun – and why not have a little PG fun! The idea of creating a Banjo Babes Calendar & Showcase Album actually percolated into the brains of a couple of the artists you will meet this year in the project. For me, my first exposure to a similar concept was when my accordion-wielding father started proudly hanging his Accordion Babes Pin-Up Calendar in his office. This was years ago. Since then, he has been buying one every year, and enjoying the heck out of the compilation album that introduces him to so many new and talented emerging artists. I thought is was such a wonderful, creative, fun and – yes – somewhat gimmicky idea to bring lady artists together to promote music. I’m thrilled to be bringing this to the banjo world! It wasn’t until I was introduced to Kendl Winter – Miss October – that I realized that I wasn’t the only one who though this would be a fun and fruitful way to collaborate! Fast forward to August, 2013, and after agreeing to be the organizer for the project – I am astonished and pleased at the incredible line-up of talented young musicians who are on board for the 2014 calendar and album! From Tenessee to Uzbekistan, the project will feature semi-to fully-professional artists who pick, frail, and do everything in between on the banjo. Eagle-eyed readers will have noticed that spots for March and September are still open, and Erin says that those babes will be announced shortly. “Originally, we had just a few lady artists on board – Kendl Winter, Evie Ladin and myself – and a couple of other potentially interested gals. I made it my mission to locate and reach out to every possible candidate who fit the criteria. We had an amazing response, and are so pleased to be able to feature twelve artists this year, and possibly a couple of ‘Bonus Babes’ in the back. A complete list of the 2014 artists can be found on the Banjo Babes web site, along with links to their various web sites. There is also this sampler of some of the tracks to be included on the CD at Bandcamp. Erin is especially pleased to be able to introduce these banjo pickers and frailers to a larger audience. “The hottest action in the whole package are the five-strings on each track! Did you know that there were this many women who play some mean banjo! Yeeeehaw! One exciting aspect of the project is the collaborations amongst artists that are springing up because of it, and/or in conjunction with it! For example, Evie Ladin has started curating a show called ‘The Lady Banjo Show’ where she brings together three lady banjo acts for a triple-bill evening of lady banjo mania! I’ll be participating with her this October and December. This is a great example of how women musicians are working together to build their following! Visit the Banjo Babes Indiegogo site to reserve yours today.